General Motors Corporation introduced the Chevrolet Colorado and GMC Canyon pickup trucks in 2004 to replace the Chevrolet S-10 and GMC Sonoma compact pickups. The front-engine, rear-wheel and four-wheel drive vehicles come in three styles –- a 2-door regular cab, 4-door extended cab, and a 4-door crew cab. Whether you use your 2015 or 2016 GMC Canyon or Chevrolet Colorado as a work truck or your daily driver you may want to enhance its performance. That’s where the Spectre 9030 air intake kit comes in. The intake is designed to boost horsepower and torque on the 3.6-liter V6 powered Colorado and Canyon. 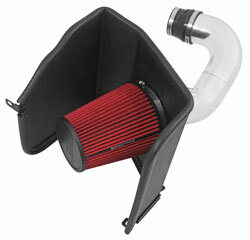 The air intake includes a Spectre HPR9891 washable and reusable conical air filter. 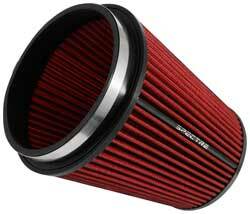 The filter features a non-woven synthetic media that is designed for superb airflow. Spectre also offers the HPR4820 air filter cleaning kit that is specially formulated to cleanse and recharge the filter so that it can be used over and over again for the life of the vehicle. The air intake has a polished aluminum tube, a black powdercoated heat shield that blocks the hot engine air from invading the intake inlet, six stainless steel clamps and two couplers. The kit is easy to install using common hand tools.